If you put a notice on your house saying you don’t want any junk mail and you don’t want people knocking on your door selling you goods and services, does that apply to charity fundraisers? This question of “no cold calling” has been a matter of fierce debate in the UK nonprofit sector recently and has finally reached a resolution that will not be universally welcomed by fundraisers. Door-to-door recruitment, after all, is a lucrative source of donors and funds, albeit a relatively unpopular one among the public. Last year, some 670,000 people signed up on the doorstep, yielding between £96 and £120 each for good causes. The issue began to develop a head of steam last year when a doorstep fundraiser working on behalf of Marie Curie Cancer Care chose to knock on the door of someone displaying a “no cold calling” sign. The resulting complaint was not successfully resolved by the charity, so in accord with procedure in self-regulation, the matter was passed to the Fundraising Standards Board, the membership body that adjudicates in the most intractable cases. The FRSB rejected the complaint because the Code of Fundraising Practice—set by the standards committee of the professional body, the Institute of Fundraising—did not forbid fundraisers from ignoring “no cold calling” signs. But the FRSB was not happy, and the IoF agreed to set up a working group to consider the issue. The wheels moved slowly, and before the working group had reported, the FRSB found itself adjudicating on another “no cold calling” complaint, this time from a citizen with a sign on the door who was disturbed by a knock from a fundraiser from the famous Battersea Dogs and Cats Home in London. The complainant was particularly concerned because they were told by the charity that it intended to continue approaching households displaying “no cold calling” signs unless the Code of Fundraising Practice was changed to say this should not happen. The FRSB considered the complaint as a potential breach of the “respectful” principle of the IoF code, but ruled in January of this year—reluctantly, it would seem—that a breach had not occurred. It urged the IoF to make its review a priority. 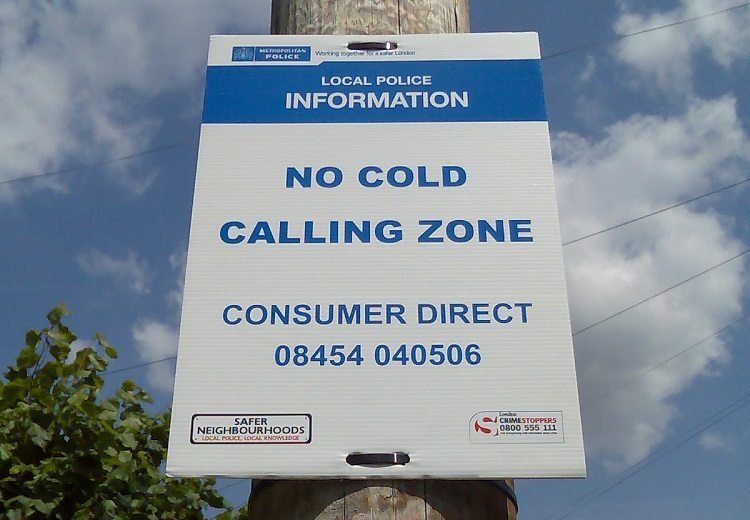 Last week, the IoF announced its decision: There would be a new rule saying fundraisers should not knock at houses displaying “no cold calling” notices. Note that the IoF has been under all sorts of pressure recently over the case of Olive Cooke, a lifelong fundraiser and charity donor who had been found dead and who had been receiving huge amounts of direct mail from charities. Only a few days before the IoF’s announcement, the Institute had been warned by the charities minister, Rob Wilson, that “no cold calling” should be observed by fundraisers, and the head of the country’s most influential umbrella body, Sir Stuart Etherington of the National Council for Voluntary Organizations, declared there should be “no more of the ‘no cold calling’-stickers-don’t-apply-to-charities nonsense.” Would the IoF have made the same decision had the Olive Cooke case not been running? It’s a moot point, and particularly so because it accidentally emerged just before the IoF’s announcement that the Public Fundraising Regulatory Association—yes, yet another fundraising body, which self-regulates street and door-to-door fundraising—had recently conducted research among 7,000 people who had signed up for regular giving on the doorstep that showed that 5.2 percent of them were actually displaying “no cold calling” stickers. If that figure were therefore extrapolated to the entire door-to-door sector of more than 680,000 donors in 2014–15, then 35,777 donors would not have been recruited if a ban on “no cold calling” stickers had been in place. This would have meant a loss in annual donations of between £3.4m and £4.2m. This being the case, the welcome for the IoF decision from some fundraisers was made through gritted teeth. The IoF’s view was it needed to draw a balance between the duty of charities to raise funds for their charitable causes and the need for fundraisers to maintain public trust and confidence. It must have been the tough decision, but the consensus in the sector appears to be that it was the right one. Sometimes, it seems, long-term public goodwill is judged to be a stronger asset than fast financial returns. Many people in charities and nonprofits in the UK will be glad to see the back of 2015. Tensions and criticisms that had been building for some time burst into the open, and the repercussions are likely to be game-changing.